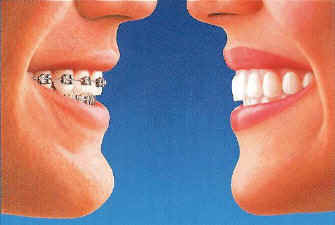 In the late 1990s, Invisalign developed a system of invisible braces. 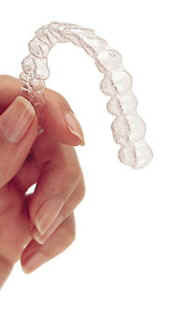 It uses clear plastic “aligners” to straighten your teeth. They take advantage of sophisticated computer technology, and eliminate the need for unsightly wire-and-bracket braces. Find an Invisalign invisible braces dentist on our referral page. And they work very well. The clearest advantage is that they are practically invisible. But since they are manufactured by the computer with great precision, they move teeth more efficiently than conventional braces, so they take only half the time, or even less. Average treatment time is around twelve months, with some cases being completed in six months. But they do have some limitations. For example, they can’t be used to move teeth that aren’t yet fully erupted. They also don’t work well for severe crowding. There are other situations where the best way to move the teeth is with conventional braces. But, because they are invisible, comfortable, and fast, patients love them. They are particular favorites with adults and older teenagers. Find an Invisalign Dentist on our referral page. Some Invisalign offices will offer you a free consultation to evaluate whether or not you are a good candidate for this procedure. Visit the invisible braces referral page for a list of recommended dentists. When you are looking for an Invisalign dentist, we recommend dentists who are able to deliver Invisalign services and cosmetic dentistry at an expert level. This is because when dentists have the broader cosmetic dentistry training, we feel they are better able to address your needs. For example, there may be another cosmetic dentistry solution that could be better and less expensive. Or, a combination of cosmetic dentistry services may be desirable for your case. We select these dentists based on training and attitude. Also, many orthodontists who are Invisalign certified are steeped in traditional thinking and are reluctant to use this new technology. After a complete examination and once it is determined that this Invisalign treatment will work for you and you agree to begin, the dentist will take highly detailed impressions of your teeth. These impressions will be sent to the Invisalign lab and will then be scanned by computer. The computer will aid in planning tooth movements and will fabricate a series of 12 to 48 clear aligners. The dentist will then give you the first set, and you will snap it in. The first thing you will notice is that the aligner doesn’t quite fit your teeth. The reason is that it is made to fit a new position for your teeth. For the next few days, your teeth will gradually move to this new position and the aligner will become loose. Then there is a few days’ rest while your teeth stabilize in their new position. After two weeks, you snap in a new aligner, which again won’t quite fit. This process is repeated until the teeth are fully moved into the desired positions. During this process, you visit the office approximately every four weeks so the dentist can monitor the treatment, address any problems, and make slight corrections. Invisalign is truly invisible, so that no one can tell that you’re straightening your teeth. They are removable, so you can eat and drink what you want while in treatment, besides being able to brush and floss normally. They are comfortable, because there are no metal wires or sharp brackets to irritate your cheeks or tongue. They are faster. Cases take about half the time of conventional braces. There are fewer appointments. Half or more of the aligner changes can be done at home. Also, since all the steps are pre-planned by computer, adjustment appointments in the office are quicker. Since the movements are planned by computer, they are more efficient. 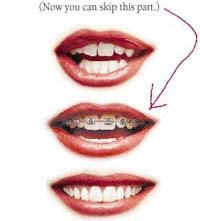 Often, with regular braces, teeth end up being moved back and forth in an effort to get them into the correct positions. Since there are no brackets to catch food or plaque, the risk of tooth decay or tooth damage from braces is significantly lower with Invisalign. The absence of sharp metal brackets makes it much easier to play woodwind and brass musical instruments. Teenagers involved in sports also like them. Since they are removable, patient compliance is required. For some teenagers, this could be an important issue. Teenagers who are prone to losing things may also have difficulty with this system. It isn’t appropriate for every case. There are some types of crowding for which Invisalign simply won’t work well. The sophisticated computer technology involved makes Invisalign be a little more expensive than traditional braces. For a list of frequently asked questions with their answers, see our invisible braces page. Read Dr. Hall’s blog posts about Invisalign, where he answers patients’ questions. Click here to ask Dr. Hall a question yourself.